I visited the new model at The Parks at Legacy yesterday. Prosper is definitely growing! 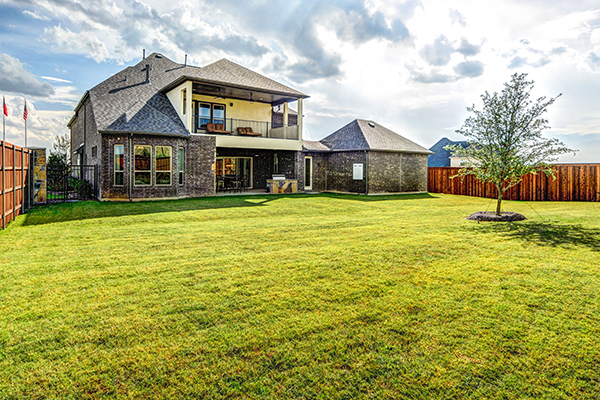 This new community boasts plans from 2350-3645 square feet and is centered around the 7-acre Prairie Park. 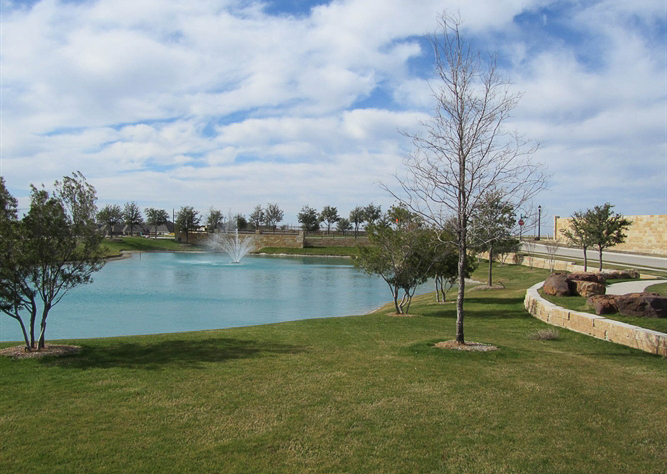 Prosper gives you the small-town feel with quick access to the big city. Entrepreneur Abid Abedi will begin construction on a $60 million townhouse project early next year. Development of the 182 new single-family townhouses on 19 acres at the northwest corner of Plano Pkwy and Independence Pkwy has been a decade in the making. Abedi acquired the tract from networking technology firm Alcatel-Lucent in 2005 after a deal with another homebuilder fell through. The investor and his brokers from Novus Reality Advisors lobbied to change the zoning, and city council recently approved Abedi’s project, which will bring 182 two-story townhomes ranging from $300,000s to the $350,000s. Locally based Megatel Homes Inc. will build the homes. The company will start construction in first quarter 2015. 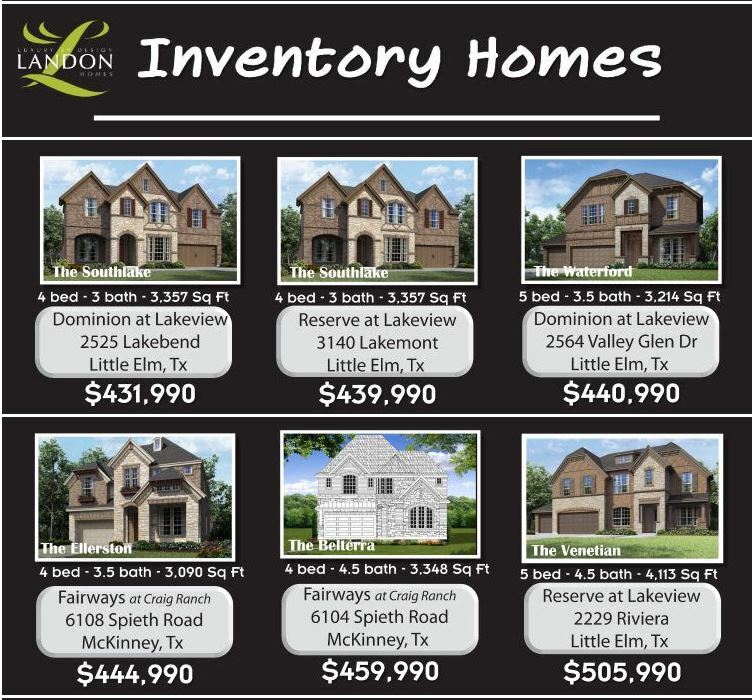 Landon Homes is currently building in Frisco, Little Elm, McKinney, and Plano in several master-built communities. 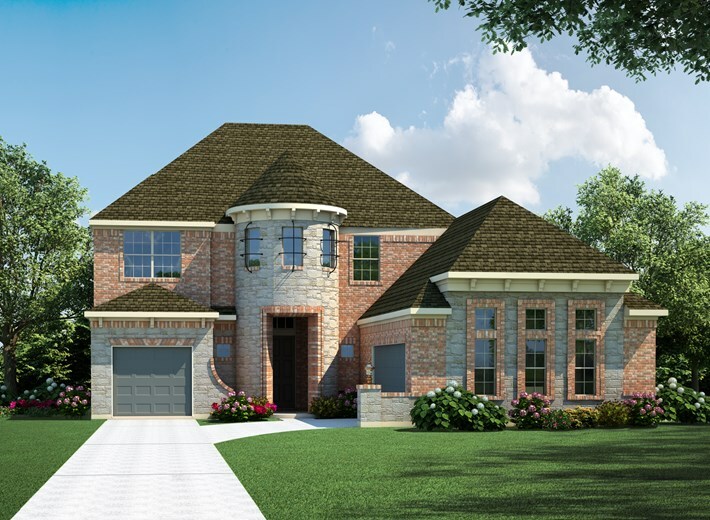 Landon Homes is highly rated among luxury home builders in north Texas, offering better built, affordable, eco-friendly homes. There are currently several move-in ready homes. If you’d like to see their complete inventory, click HERE. Interested in this builder? Contact me first! Don’t forget WHY you need a realtor for a new build! M. Christopher Custom Homes are spacious and luxurious. 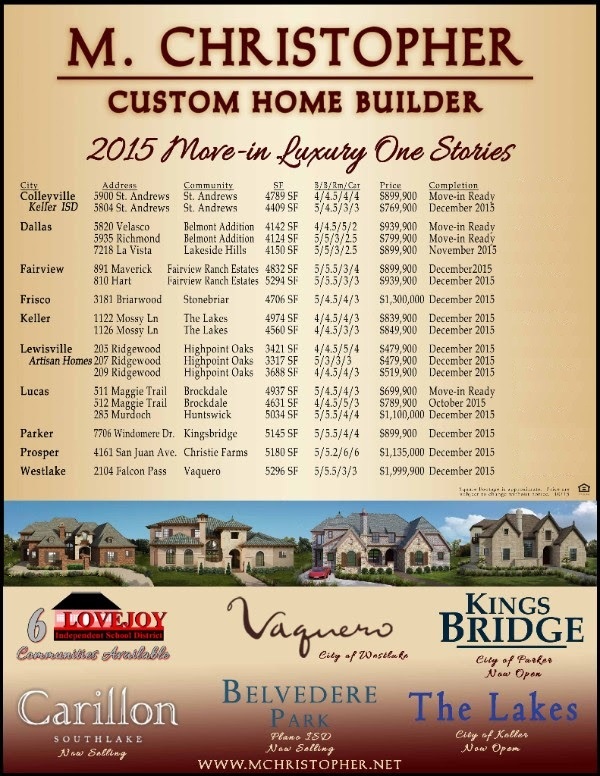 They have several ONE-STORY homes that are move-in ready or with completion dates by the end of the year! Large single story homes are hard to find! Interested in one of these homes? Contact me first! Don’t forget WHY you need a realtor for a new build! 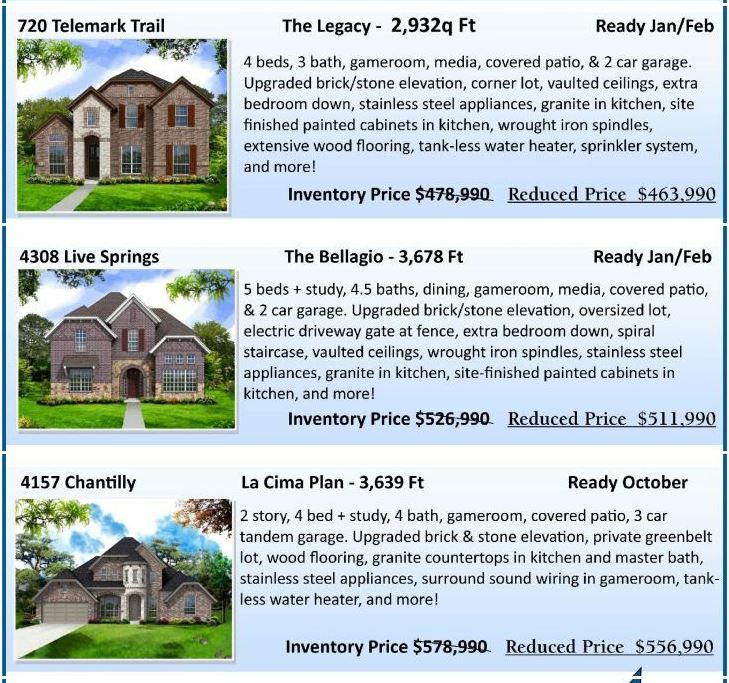 It is a rare in the current market to find new construction homes in the $200s, but HistoryMaker Homes has several affordable communities across DFW. Interested in these homes? Contact me first! Don’t forget WHY you need a realtor for a new build! Interested in this deal? Contact me first! Don’t forget WHY you need a realtor for a new build! Current Deal: $8,000 in closing costs plus the owners title policy! PLUS $1500 in upgrades as my personal gift to you! Current Deal: $20,000 discount on all inventory homes! Current News: Hurry! Saddle Creek is currently in CLOSEOUT. This beautiful community has large home sites, several beautiful lakes, hike and bike trails and excellent schools. Prosper was designated by D Magazine as the “5th Best Dallas Suburb” in 2010. In Saddle Creek you are able to combine country living with all the amenities of the big city.